It’s been over a week since I posted a breakfast recipe…it’s time for another. And not so surprisingly, it’s another pumpkin recipe. 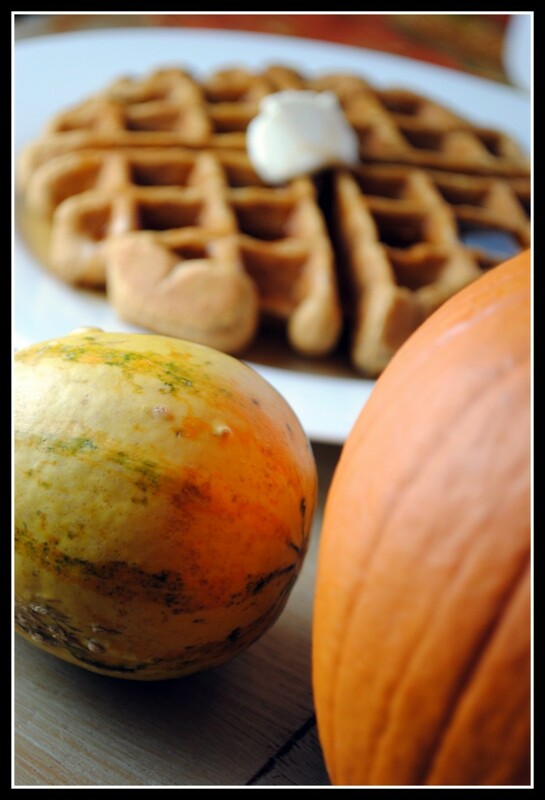 If you haven’t noticed by now, I love pumpkin and use fall as an excuse to eat it…a lot. Plus, pumpkin is a nutrition super star. Not only is pumpkin low in calories and naturally fat-free, it is also an excellent source of not only fiber, but antioxidant vitamins A, C, and E! 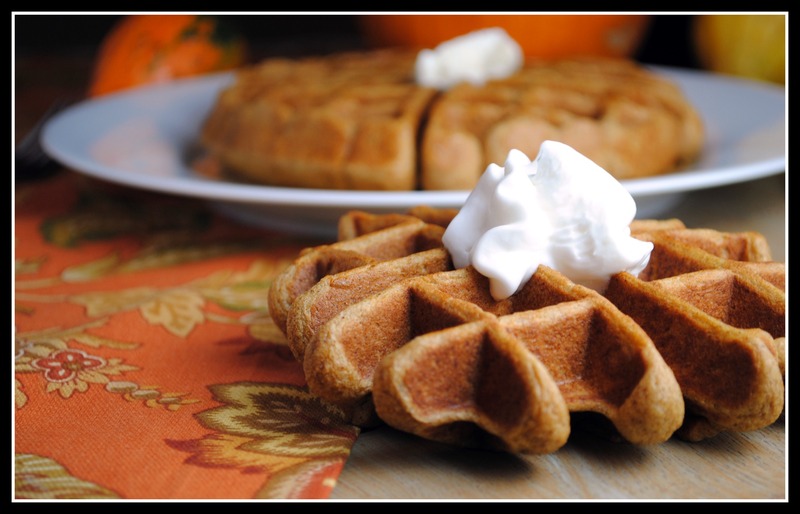 When you take nutritious pumpkin and add in whole wheat flour, protein-packed egg whites, and fall spices such as cinnamon, ginger, and nutmeg…there’s no going wrong. Normally, Mr. Prevention isn’t a big breakfast food lover. These, however, he gobbled up…x2. I guess I should’ve doubled the recipe as I love to reheat waffles in the toaster oven for mornings to come. Are we seeing a familiar pattern with Mr. Prevention and my pumpkin recipes lately? Stir the flour, baking soda, salt, sugar, cinnamon, nutmeg, and ginger together in a small bowl. In a separate bowl, whisk together the egg white, pumpkin, and buttermilk. Stir into the dry ingredients and stir just to combine. 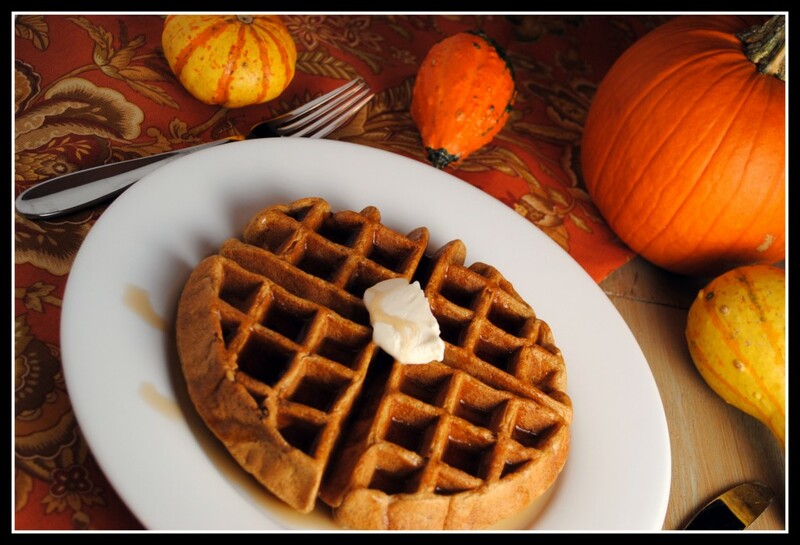 Heat a waffle iron or skillet over medium high heat and spray with nonstick spray. Pour half the batter into the preheated iron or pan. If making waffles, cook according to manufacturer’s suggestion. If making pancakes, cook until bubbles appear on the top, about 3 minutes. Flip and cook an additional minute or two. Repeat with remaining batter. Serve with maple syrup. Yield: 4 servings (4 large waffles or 8 pancakes). Result: Fall in waffle form! Cinnamon and nutmeg and ginger…oh my! While whole wheat flour can make waffles dense and heavy, the buttermilk is balances the batter out for a perfectly fluffy waffle (or pancake!). 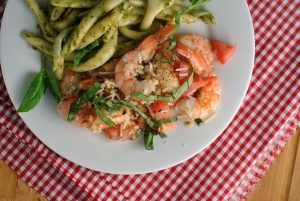 These are simple to make and offer up great nutrition stats, too. Enjoy! TGIF! I am not even going to whine about having to work tomorrow…yet 🙂 It has been another insane week so my plan is to workout this morning so that after work, I can go out to dinner with the hubs. 😀 I know myself well enough to know that Friday evening workouts are usually the easiest to skip! Question: Anything fun planned this weekend? Going to a wedding up north this weekend. Nick and I are excited to escape C-bus for a while! North Ohio? My neck of the woods 😉 Have fun! Definitely making these this weekend. I’ve gone through 6 cans of pumpkin this month! Great photos Nicole! These sound yummy. Trader Joe’s was out of canned pumpkin yesterday – glad I stocked up last time! My brother, sister-in-law, and I did a surprise 40th anniversary celebration last weekend for my parent’s, so I’m taking this weekend off to catch up from that! 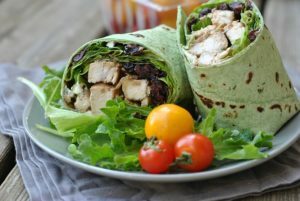 I am having dinner with a friend at Whole Foods, so looking forward to that. These look great! I was just wondering what you would suggest as a topping/syrup for these? YUM! I haven’t used my waffle iron in a while, looks like I need to dust it off! I need to stop stumbling food sites when my belly is a rumblin. I would eat the waffles so hard. I am in a friend’s wedding tomorrow and then another friend’s bridal shower. Story of my life. haha. These look so good! Great photos. I’m loving all the pumpkin creations I’m seeing lately. Happy Friday – hope you finally get a relaxed (i.e. “non-traveling!”) weekend! Dear Nicole. Please send 2 dozen of these waffles! If you can’t do that, please send me your waffle iron! 🙂 Have a fantastic weekend. 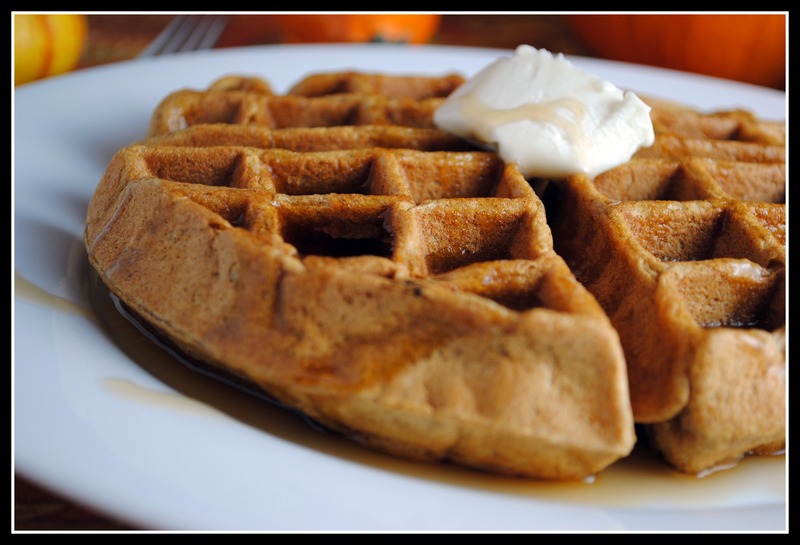 My husband is a pancake person while I prefer the waffles – I love pumpkin waffles (especially with some chocolate chips in them). I have class all day tomorrow – Sunday will be spent working on a midterm as well. Unfortunately not a fun weekend for me! Looks scrumptious! I actually had a yogurt mess with pumpkin last night for dinner 🙂 Bring on the pumpkin and spice season! Love it. I have to work tomorrow too, booo. And I think I’m trying to get sick =/ but I am going to do my best to fight it off. We have dinner plans on Saturday and have tickets to go see the Lion King before it leaves Vegas. Have a great weekend! Perfect breakfast for the fall season! I’m really a sucker for a healthy waffle recipe, this has my name written all over it. I’m defiantly making these for my family and I on Christmas morning, MMM can’t wait! I was just wondering though, is it possible to use just regular Pastry Flour rather than the Whole Wheat Pastry Flour? Thanks, Kayla! I hope you enjoy them, too!